This is the second half of the RT-AC87 review. It will focus on wireless performance and stress testing its combination Broadcom / Quantenna architecture. And since this is the first we have encountered Quantenna's QSR1000 "wave 2" AC device, we'll throw in some device interoperability testing and a look at four-stream performance. As we noted in the First Look, this review applies both to the RT-AC87R that is currently exclusive to Best Buy and the RT-AC87U that will soon be available everywhere. The two differ only in nomenclature. They have the same exact hardware and run the same exact firmware. (So stop asking, already!) I'll continue to refer to the product as the RT-AC87 or AC87 in this review. The RT-AC87 was tested using the new V8 Wireless test process. As noted in the NETGEAR R8000 part 2 review, you will find that 5 GHz band range is less than produced by the V7 process. While many products made it all the way out to 45 dB attenuation without disconnecting in the V7 process, most products don't make it past 39 dB in the V8 process. So use the Test version filters in the Charts and especially in the Rankers when doing product research. I cut ASUS (and Quantenna) much more slack than I normally give companies, waiting for a second firmware release before testing wireless performance and taking some heat in the forums for doing so. I also shared test results and participated in conference calls with both companies, pre-review, sharing test method details and even doing some requested retesting. I did this for selfish reasons, mainly to avoid having to retest soon after the review was published, not as a means to favor either company. All the testing in this article was done using 3.0.0.4.376_2061 firmware, which, according to the release notes, contains the latest Quantenna driver and other wireless performance enhancements. 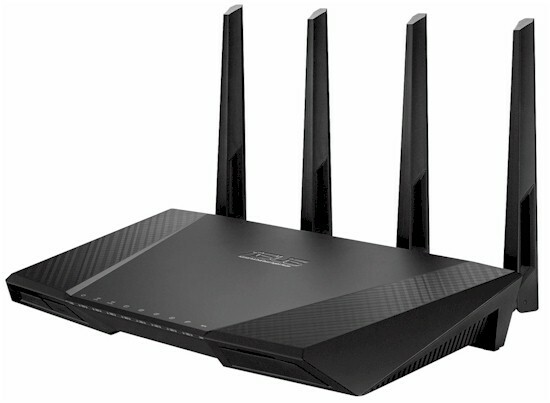 Unlike NETGEAR's R8000, the RT-AC87U is Wi-Fi Certified. Note, however, that its ac certification is for three spatial streams only; 4x4 operation was not tested or certified. The RT-AC87 defaults to 20/40 MHz bandwidth mode in 2.4 GHz and 80 MHz mode in 5 GHz upon power-up. Both radios defaulted to Auto Channel selection on power up. The setup wizard encountered upon first boot forces you to set SSID and encryption key for both radios before letting you exit it. I didn't run checks for WPS or 40 MHz Coexistence / Fat channel intolerance. Unlike NETGEAR, ASUS does not provide an explicit 20/40 MHz Coexistence disable. But the 2.4 GHz channel bandwidth selection includes 20, 40 and 20/40 MHz modes, so I suppose the 40 MHz mode does the same thing as NETGEAR's disable. For throughput testing, the router was first reset to factory defaults with channel 6 set for 2.4 GHz and bandwidth mode set to 20 MHz. The 5 GHz radio was set to channel 153 and 80 MHz bandwidth mode to enable 802.11ac link rates. The NETGEAR R7000 in bridge mode now used as our standard test client was connected using WPA2/AES encryption. This means that the profile data in the charts is for three stream operation. I also tested (or tried to) four-stream operation using a second RT-AC87U in media bridge mode. I'll get to that later. Our standard practice with the new testbed is to center the router under test's antennas on the turntable, both front-to-back and side-to-side in the chamber. The chamber antennas are also centered on the turntable (front-to-back of chamber). This method is intended to keep maximum distance between the router under test and chamber antennas. Since the AC87's antennas are on the back of the router, the front edge of the router hung over the side of the turntable a bit. There was still plenty of room in the chamber for the router to be rotated the full 360 degrees during testing. The Benchmark Summary below shows the average of all wireless throughput measurements made over the tested attenuation range. Since the 2.4 GHz radio is the same found in AC1900 routers, it's fair to compare its results against products in that class. Comparison with AC1900 (and AC1750) routers in 5 GHz is fair too, since the AC1900 client limits maximum link rates to 1300 Mbps. Note that improved 5 GHz performance vis-a-vis three stream routers is possible due to the four RF chains in the Quantenna 5 GHz radio. This is similar to the effect the four chain design in the Linksys WRT1900AC may provide, even though its Marvell chipset doesn't support the four stream 1733.3 Mbps link rates that the Quantenna chipset does. That said, I pulled all the retested AC1900 routers, plus the NETGEAR R8000 into one chart of 2.4 GHz average throughput below. The AC87 tops both charts, with a greater distance between it and the next best router on uplink. Remember, you're looking at all three-stream performance here on the 2.4 GHz side. The 5 GHz average throughput comparison finds the AC87U at the very bottom for both down and uplink. Not that the R8000 didn't do much better, landing in the middle of both comparisons.